A brief overview of the four ways Jesus is present in the Mass (Catechism of the Catholic Church 1088-90). 4 Ways Christ Is Present in the Mass - Duration: 3 minutes, 59 seconds. Why Do Catholics Baptize Babies? - Duration: 8 minutes, 31 seconds. An overview of theological and Biblical reasons for why the Catholic Church gives Baptism to infants. What Are the Nine Choirs of Angels? - Duration: 5 minutes, 29 seconds. A brief overview of the nine choirs of angels according to Catholic tradition. 4 Misconceptions About the Catholic East - Duration: 6 minutes, 36 seconds. General myths about the Eastern Catholic Churches united to Rome. See official Magisterial documents about the Eastern churches below. Rev. Dr. John Arthur Orr, M.A., M.Div., Ph.D.
How Long Does Christmas Last? - Duration: 4 minutes, 3 seconds. 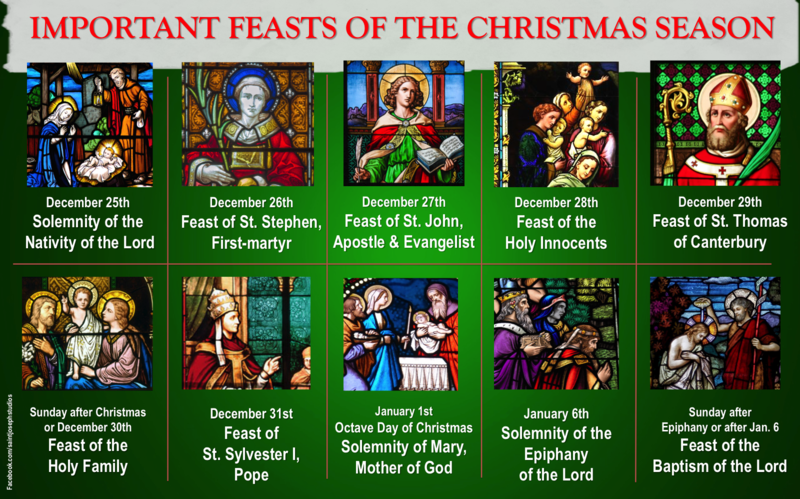 A brief overview of the feasts of the full Christmas season. What is Advent? - Duration: 5 minutes, 51 seconds. A brief overview of the Church's Advent season. What Time Was Jesus Born? - Duration: 100 seconds. A brief look at the prophecy which inspired songs like "It Came Upon A Midnight Clear" and customs like Christmas Midnight Mass. What Do the Nativity Ox & Donkey Symbolize? - Duration: 2 minutes, 18 seconds. A brief look at the symbolism of Nativity animals. Do Saints & Angels Pray for Us? (Bible Proofs) - Duration: 5 minutes, 7 seconds. A brief look at how the glorified Church of Heaven still intercedes for pilgrim Church on Earth as found in the Bible. Death does not amputate the members of Christ's body from one another. Bishop Robert Barron's Blessing of Saint Joseph School & Studio - Duration: 16 seconds. Thank you to Bishop Robert Barron for blessing Saint Joseph School and its video studio upon your visit to the Diocese of Knoxville's Eucharistic Congress. What is the Assumption of Mary? - Duration: 9 minutes, 38 seconds. A brief overview of Catholic Church teaching on the dogma of the Assumption. Check out the links below for further study. Did the Blessed Mother Die? - Duration: 4 minutes, 2 seconds. Was Mary assumed directly into heaven or did she die first? Was John the Baptist Born Without Original Sin? - Duration: 2 minutes, 40 seconds. What is Sacred Tradition? (Powerpoint - no audio) - Duration: 3 minutes, 46 seconds. The War Against the Spirit: The Ancient Defense of the Advocate - Duration: 2 minutes, 40 seconds. A Call to Discipleship: Diocese of Knoxville - Duration: 29 minutes. The History of All Saints and All Souls Days - Duration: 12 minutes. What is the Immaculate Conception? - Duration: 12 minutes. "Understanding the Eucharist" - Part 1 of 3, Dr. Scott Hahn (Audio) - Duration: 30 minutes. "The Healing Power of Confession" - Part 1 of 3, Dr. Scott Hahn (Audio) - Duration: 30 minutes. "Former Satanist Becomes Catholic", Betty Brennan, Part 1 of 2 (Audio) - Duration: 30 minutes. Seven Reasons to be Catholic, Reason 1: Narrowing the Choices - Duration: 11 minutes. "The Virgin Mary Through Scripture" - Part 1 of 3, Dr. Scott Hahn (Audio) - Duration: 30 minutes. The Catholic Truth About Halloween - Duration: 13 minutes. "Understanding the Eucharist" - Part 2 of 3, Dr. Scott Hahn (Audio) - Duration: 29 minutes. What Does the Word "Catholic" Mean? - Duration: 6 minutes, 24 seconds. "The Healing Power of Confession" - Part 2 of 3, Dr. Scott Hahn (Audio) - Duration: 30 minutes. Video links detailing the Trinity and Incarnation (featured speakers: Father Robert Barron, Dr. Scott Hahn). What are the Most Common Views of God? - Duration: 3 minutes, 47 seconds. What Images of God are Present in the Old Testament? - Duration: 84 seconds. What Images of God Exist in the New Testament? - Duration: 77 seconds. So what about God? - Duration: 106 seconds. How do we know we are encountering God? - Duration: 112 seconds. Bishop Barron on Who God Is & Who God Isn't - Duration: 9 minutes, 57 seconds. What is the Trinity? - Duration: 2 minutes, 25 seconds. Can God Really Be Both One and Many? - Duration: 117 seconds. Can We Completely Understand the Trinity? - Duration: 104 seconds. Is the Truth of the Trinity Found in Scripture? - Duration: 46 seconds. How Does the Church Fit Into and Serve the Trinity? - Duration: 2 minutes, 4 seconds. Videos detailing each of the seven sacraments or mysteries and how the sacraments extend the visible ministry of Christ through his body the Church. "The Healing Power of Confession" - Part 3 of 3, Dr. Scott Hahn (Audio) - Duration: 11 minutes. Bishop Barron on Being Born Again - Duration: 12 minutes. Why do I have to confess to a priest? (#AskFrBarron) - Duration: 2 minutes, 28 seconds. "Understanding the Eucharist" - Part 3 of 3, Dr. Scott Hahn (Audio) - Duration: 12 minutes. "Women and the Priesthood" - Part 1 of 3, Dr. Peter Kreeft (Audio) - Duration: 30 minutes. "Women and the Priesthood" - Part 2 of 3, Dr. Peter Kreeft (Audio) - Duration: 30 minutes. Jesus as Origin & Foundation of the Church - Duration: 6 minutes, 29 seconds. "Why Do We Have a Pope?" - Dr. Scott Hahn, Part 1 of 3 (Audio) - Duration: 20 minutes. "Why Do We Have a Pope?" - Dr. Scott Hahn, Part 2 of 3 (Audio) - Duration: 20 minutes. "Why Do We Have a Pope?" - Dr. Scott Hahn, Part 3 of 3 (Audio) - Duration: 26 minutes. What Gifts Does God Give the Catholic Church? - Duration: 3 minutes. Bishop Barron on Why It's Okay to be Against Heresy - Duration: 8 minutes, 44 seconds. Bishop Barron on Vatican II, the Greatest Meeting Ever - Duration: 9 minutes, 2 seconds. Bishop Barron on The Meaning of Vatican II - Duration: 10 minutes. "The Four Marks of the Church" - Part 1 of 3, Dr. Scott Hahn (Audio) - Duration: 29 minutes. "The Four Marks of the Church" - Part 2 of 3, Dr. Scott Hahn (Audio) - Duration: 30 minutes. "The Four Marks of the Church" - Part 3 of 3, Dr. Scott Hahn (Audio) - Duration: 7 minutes, 28 seconds. Is Peter the Rock in Matthew 16:18? - Duration: 6 minutes, 38 seconds. Video captures of PowerPoints summarizing Catholic Church history. Both presented for the RCIA catechumenate at Sacred Heart Cathedral, Knoxville, TN. Also, other Catholic media is featured which clarifies controversial periods of history in detail. Catholic Church History PowerPoint (HiDef - no audio) - Duration: 2 minutes, 20 seconds. Catholic Church History Powerpoint (Without audio). - Duration: 18 minutes. Archeology and History can enhance your faith! - Duration: 4 minutes, 40 seconds. Journey Home - CHN Deep in History Conference, October 2010 - Marcus Grodi - 02-07-2011 - Duration: 55 minutes. Did the Emperor Constantine found the Catholic Church? - Duration: 3 minutes, 2 seconds. Who were the Church Fathers? - Duration: 3 minutes, 14 seconds. Early Church Fathers: Who are the Early Church Fathers? - Duration: 4 minutes, 37 seconds. JH #409 Study Of Early Church Fathers Begins The Journey To Conversion - Duration: 10 minutes. Conversion of Steve Ray and Michael Cumbie - on structure of the early church - Duration: 9 minutes, 45 seconds. Did the Fathers always agree with each other? - Duration: 3 minutes, 15 seconds. Are any Church Fathers mentioned in the Bible? - Duration: 4 minutes, 58 seconds. Which Church Father was elected bishop before he was even baptized? - Duration: 4 minutes, 18 seconds. Catholic teachings on St. Mary, Mother of God and of the Church. "The Virgin Mary Through Scripture" - Part 2 of 3, Dr. Scott Hahn (Audio) - Duration: 30 minutes. "The Virgin Mary Through Scripture" - Part 3 of 3, Dr. Scott Hahn (Audio) - Duration: 7 minutes, 43 seconds. Scott Hahn on the Queenship of the Blessed Virgin Mary - Duration: 4 minutes, 26 seconds. Scott Hahn on the Assumption of the Blessed Virgin Mary - Duration: 8 minutes, 49 seconds. Scott Hahn - Mary: Christ's Greatest Masterpiece - Duration: 7 minutes, 39 seconds. Mary in 2 Minutes - Duration: 2 minutes, 43 seconds. How did the Church Fathers explain the perpetual virginity of Mary? - Duration: 3 minutes, 16 seconds. The Truth About Mary and Scripture: MUST SEE! - Duration: 11 minutes. The significance of solemn feast days of the Catholic Church. The History of All Saints and All Souls Days- Extended Version - Duration: 13 minutes. Easter is Not Pagan - Duration: 9 minutes, 17 seconds. The Season of Lent - Duration: 8 minutes, 2 seconds. Bishop Barron on All Saints Day - Duration: 9 minutes, 12 seconds. Is Easter Pagan? - Duration: 15 minutes.